The Dot applies tried-and-true principles drawn from traditional community reporting to the Internet’s cultures and localities. 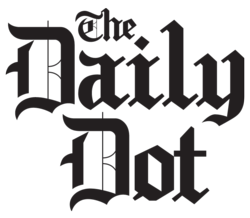 The Daily Dot, the hometown newspaper of the World Wide Web, today unveiled its website to the public for the first time. For the last three months, the Dot has been reporting from Web communities like Facebook, Twitter, YouTube, Tumblr, Etsy, Reddit, 4chan and more. The Dot applies tried-and-true principles drawn from traditional community reporting to the Internet’s cultures and localities. Sections include Culture, Entertainment, News, Business, Politics, and more. The key distinction for the website’s locally-based coverage is that instead of reporting from physically-bound communities like Sandusky, OH, or Baltimore, MD, the Daily Dot focuses on Web-based “geographies” that only exist online. The Dot solves the problem that the Web today lacks a true paper of record. These communities to date have only ever been covered as businesses, technologies or worse, as curiosities. Little attention has been paid, by contrast, to the human elements of these groups and networks, drawn from within, by the everyday reporting and seeking out of the untold stories and unsung members. In addition to exclusive and unique Web comics and a guide to important events around the Internet, the Daily Dot features the Dot Leaderboards. The Leaderboards, created in partnership with deep-data analytics company, Ravel, present rich data that tell a story about Web communities’ contributors, ranking the users on a variety of metrics by tracking activity, engagement and influence. The Dot is exploring data from within specific networks, as well as across multiple communities, to understand how members impact the Web as a whole. Reddit and Tumblr lists can be accessed now, with additional communities on the way. The Daily Dot runs on the Armstrong CMS platform, a pioneering new journalism content management system funded by a Knight Foundation grant, to which the team is also playing a contributing role. Special commemorative print editions of the Dot were reported to be floating around Austin, San Francisco and New York, as well. The Daily Dot is the brainchild of founders Nicholas White, Nova Spivack and Josh Jones-Dilworth, and Owen Thomas serves as Founding Editor. The editorial team includes Senior Editor-Hacker, Grant Robertson, Senior Editor, Janet Kornblum, and counts more than a dozen journalists, veterans and newcomers, all intensely curious and involved in the Web’s varied communities. For more information visit dailydot.com. The Daily Dot is the hometown newspaper of the World Wide Web. The Dot reports on Web communities, from Facebook to Tumblr to Reddit, in the way a traditional community newspaper might report from Austin, TX, or Charlotte, NC. Built on the pioneering news platform, Armstrong CMS, and with a firm commitment to data-driven journalism, the Daily Dot reports on the most important and relevant topics from within online communities and allows readers to access the stories across multiple platforms, where they live, online. The company was founded in 2010 by CEO, Nicholas White, and Co-founders, Nova Spivack and Josh Jones-Dilworth. Founding Editor, Owen Thomas rounds out the executive team.